Why is nitrosobenzene electrophilic on O in organocatalytic oxygenations? which is all nice, except for the slightly counterintuitive fact that PhNO is acting as an electrophile on oxygen rather than on nitrogen. Is there an explanation for the regioselectivity here? Zhong, G. A Facile and Rapid Route to Highly Enantiopure 1,2-Diols by Novel Catalytic Asymmetric α-Aminoxylation of Aldehydes. Angew. Chem. Int. Ed. 2003, 42 (35), 4247–4250. DOI: 10.1002/anie.200352097. Brown, S. P.; Brochu, M. P.; Sinz, C. J.; MacMillan, D. W. C.The Direct and Enantioselective Organocatalytic α-Oxidation of Aldehydes. J. Am. Chem. Soc. 2003, 125 (36), 10808–10809. DOI: 10.1021/ja037096s. Zuman, P.; Shah, B. Addition, Reduction, and Oxidation Reactions of Nitrosobenzene. Chem. Rev. 1994, 94 (6), 1621–1641. DOI: 10.1021/cr00030a007. 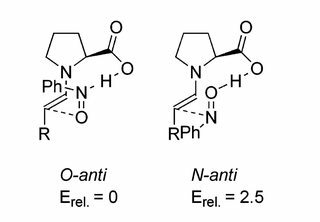 Using proline as the catalyst provides enantioselectivity to the process, but also allows N vs O regioselectivity to be controlled (though not always perfectly). Proline catalysis occurs via a proline enamine attack on the oxygen of the nitrosobenzene monomer with a simultaneous proton transfer from the carboxylic acid. Computational evidence shows that the observed heteroatom selectivity materializes through the difference in basicities of the oxygen and the nitrogen atoms. Source: Cheong, P. H.-Y. ; Houk, K. N. J. Am. Chem. Soc. 2004, 126 (43), 13912–13913. DOI: 10.1021/ja0464746. Not the answer you're looking for? Browse other questions tagged organic-chemistry carbonyl-compounds regioselectivity organocatalysis or ask your own question. Is the ammonium substituent (-NH3+) really meta-directing in electrophilic substitution? How is the acetoxy group ortho/para-directing in electrophilic aromatic substitution? Why do carbonyl compounds undergo nucleophilic and not electrophilic addition?